Here's an idea—why don't we round up every trance act and send them all into space? So we never have to hear that incessant doof doof noise any more. Let's hope Richard Branson agrees. Trance "act" Above & Beyond DJed in the Mojave desert yesterday for Branson's SpaceShipTwo event, and are so desperate to see space, they've asked if they can join the ride. 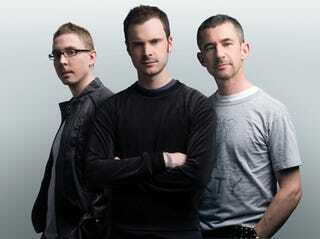 Hailing from the UK, Above & Beyond certainly sound space-nutty, sampling Buzz Aldrin in one of their tracks. "We're big fans of all things space-related and so in terms of dream gigs, this is up there alongside our performance in Rio to one million people"